Every developer team should have a good infrastructure providing and enforcing consistent output of each team member at their fingertips. Coding standard is one of many things holding a project together. It should not be obvious from a code snippet who wrote it. The entire team should have common conventions how to write code. Some can be checked automatically (code formatting), others (like sticking to designed architecture of the system) must be discussed during code review. At Slevomat, we’ve had a very strict coding standard for one and a half years called Consistence Coding Standard. It has been checked and enforced in every pull request by PHP_CodeSniffer and Jenkins. Six months ago, we added more than a handful of advanced sniffs that we commited temporarily into our private repository. Some even support automatic fixing of violatons, making integration into projects much easier. 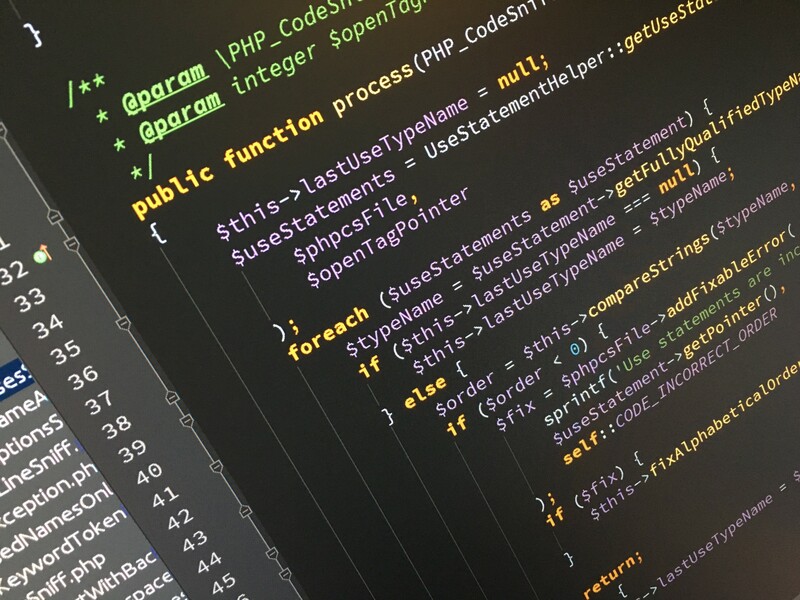 Although PHP_CodeSniffer is not suitable for static analysis because it is limited to analysing one file at a time, it is possible to use it to perform certain checks. This sniff checks for unused methods and unused or write-only properties in a class. Reported unused elements are safe to remove. This is very useful during refactoring to clean up dead code and injected dependencies. Commas after last element in an array make adding a new element easier and result in a cleaner versioning diff. Yoda conditions decrease code comprehensibility and readability by switching operands around comparison operators forcing the reader to read the code in an unnatural way. This sniff finds and even automatically fixes such expressions. Great coding standard should enforce unified code style in every place that can be evaluated objectively. This sniff prevents fighting over what is the correct order of imports at the top of each file. Another kind of dead code detection. This sniff can find and even delete extra uses. It can work with references in annotations (typically used by Doctrine Annotations) too. Above-mentioned sniffs are not the only ones we released today. You can find the complete list, comprehensive manual how to start using the whole standard (or just a handful of sniffs you find useful, no pressure!) and the source code on GitHub. We believe the code is so thoroughly tested and stable that we didn’t hesitate to release version 1.0.0.